If you've always wanted to be Carlsson på taket then you'll need the proper ride. Nice Price or Crack Pipe has just the car, and it comes with quite the Saab story. The 99 was going to be Saab's "big" car. And while it may not have been born from jets, it was a significant departure from its predecessor, the 96 in being more car-like, and providing less the appearance of being a rolling suppository. 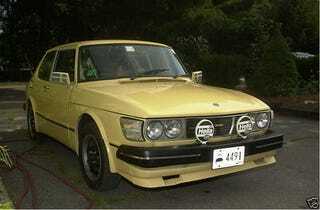 Like the 96, the 99 was front-drive, but unlike that car, the engine was neither Saab designed, nor sourced from Ford. The 99 carried the 1.7 litre 45° inline four, half the stag V8, from the Triumph Dolomite, and later TR7. In the Saab, the engine was turned 180° with the cam drive facing the firewall. This piece of eccentricity, along with shifter-locking ignition switches, front-acting parking brakes and free-wheeling clutch were what made a Saab a Saab. Another thing for which Saab was well known was rally racing, and the 99 continued the success of the 96, albeit to a lessor degree, while driven by such luminaries as Stig Blomqvist and Per Eklund. In 1971, the 1.7 litre was replaced with a 1.85 and the freewheeling clutch was dropped, meaning Saab drivers now had to contend with engine braking and 97 bhp. The basic body structure, incorporating the rally-proven suspension, and a panoramic wrap-around windscreen continued until 1993 when the derivative 900 was replaced with an Opel-based successor. This '79 Grand Luxe is currently owned by a former Saab employee, and comes with enough interesting history and add-on parts to make even the most laconic moose shuffle out of its way. The Aero body kit may not be to everyone's taste, but it is original and looks complete. What is not completely original is what's sitting (backwards) under that tilt-forward hood. Instead of the 97 bhp Saab B-motor, this car carries the 16 valve FI motor, fronted by a five speed manual which most likely still has the rubbery, indirect gear change mechanism endemic to these cars. The seller claims the engine upgrade to have been professionally done, and the pictures lend this credence. Saab 99s have one significant foe and that is the rust. This buttercup bjorn is no exception, and the seller claims that the rust fairy has visited the car on more than one occasion. But at $3,995, a little surface rust won't stop you from practicing your heel and toe prowess and looking for gravel roads slide down sideways. The makeshift holder for the Alfa timer will make such energetic excursions not only memorable, but documented as well. So what do you think of $3.995 for this agent 99? Is that a Nice Price for a Trollhättan time trialer? Or is that a lingonberry pie full of crack?